At first glance, a bright blue crescent immediately jumps out of this NASA/ESA Hubble Space Telescope image: is it a bird? A plane? Evidence of extraterrestrial life? No—it is a galaxy. The shape of this galaxy admittedly appears to be somewhat bizarre, so confusion would be forgiven. 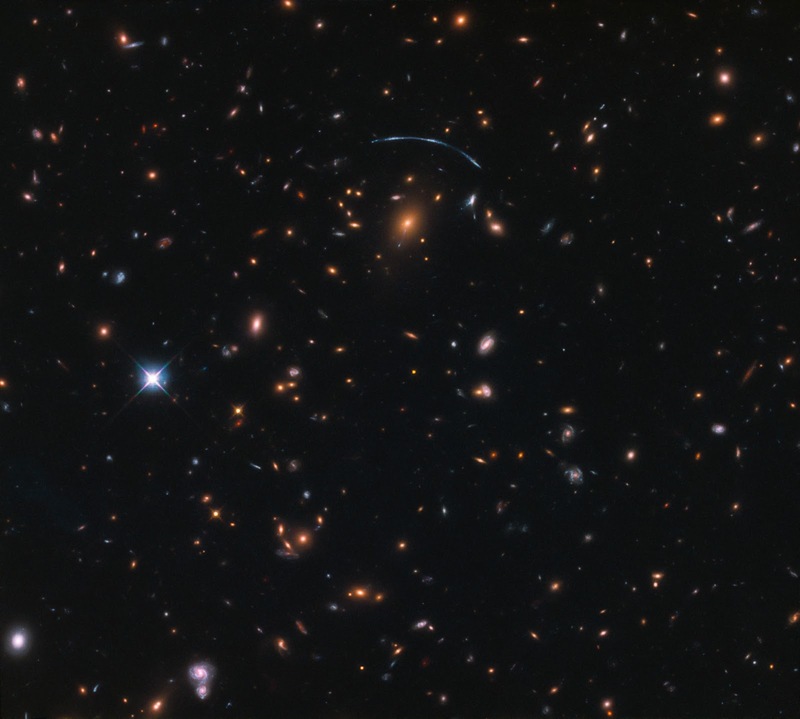 This is due to a cosmic phenomenon called gravitational lensing. In this image, the gravitational influence of a massive galaxy cluster (called SDSS J1110+6459) is causing its surroundings spacetime to bend and warp, affecting the passage of any nearby light. This cluster to the lower left of the blue streak; a few more signs of lensing (streaks, blobs, curved lines, distorted shapes) can be seen dotted around this area. This image also features a rare and interesting type of galaxy called a jellyfish galaxy, visible just right next to the cluster and apparently dripping bright blue material. These are galaxies that lose gas via a process called galactic ram pressure stripping, where the drag caused by the galaxy moving through space causes gas to be stripped away.